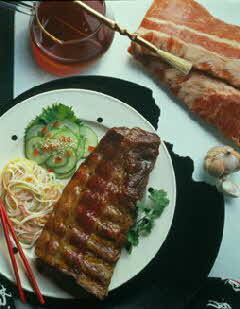 Cut spareribs into serving-size portions. Place large plastic bag in large bowl. In bag, combine remaining ingredients; mix well. Add ribs, close bag tightly. Refrigerate 6 hours or overnight; turn bag several times to distribute marinade. Drain ribs, reserving marinade. Place ribs in shallow roasting pan; cover with foil and bake in a 350 degree F. oven for 1½ hours. Uncover and brush ribs with the reserved marinade. Discard leftover marinade. Bake, uncovered, for 30 minutes or till done.